Which book do you want to know more about? As some of you know, I am a Jesus Freak and I've been itching lately to start an online Bible study to share the Bible and to grow with others. Each of these books is so different. 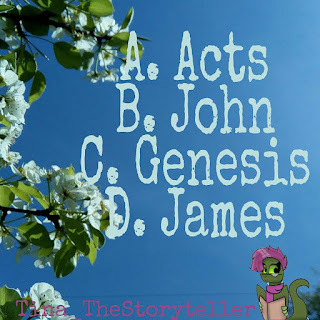 Acts tells the story of the Holy Spirit and the beginning of the church; John is one of my favorite gospels with lots of great stories about women; Genesis is the beginning and has lots of stories we learned as kids; and James, well James is like the how to of Christian living in my opinion. Let me know which one you're most interested in.